How do you carry a gift of glass flowers to a contessa? Very carefully—and with a group, if you’re Maybellinda. Maybellinda’s father has just told her and her family that he may not be able to feed them this winter. Dejected, Maybellinda is nevertheless polite to an old woman who visits her flower stall. When the gray-haired woman requests “a bright yellow flower to match my golden hair,” Maybellinda kindly complies. She is rewarded when the old woman gives her a bunch of glistening glass flowers. Maybellinda decides to take them to a count who is giving gold for the world’s most beautiful gift for his wife. If she can win the gold, she can take care of her family! Along the way she meets an entertaining mix of people. Children will have a good time following their trip and finding out what happens. The gorgeous color illustrations bring the story to life vividly. 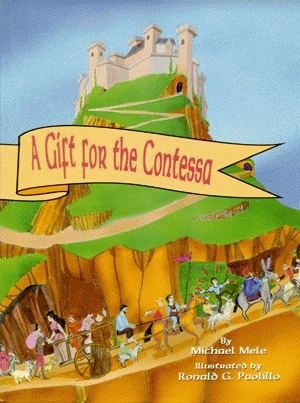 Author Michael Mele, who lives in New York City, conceived A Gift for the Contessa during his travels in Italy. The places named in the book actually exist, and some of the characters are based on people he met there. A former teacher, dancer, and choreographer, Michael is now director of Il Chiostro di Toscana, an annual artists’ retreat in Italy. He also wrote Irish Lace, a chronicle of his Irish ancestors. Ronald Paolillo played Arnold Horshack on the TV show “Welcome Back, Kotter.” An artist as well as an actor, Ron has also illustrated The Red Wings of Christmas for Pelican. He is known for his skilled color and black-and-white pen-and-ink works, which have shown and sold in New York, Hawaii, and California. Ron also lives in New York City.